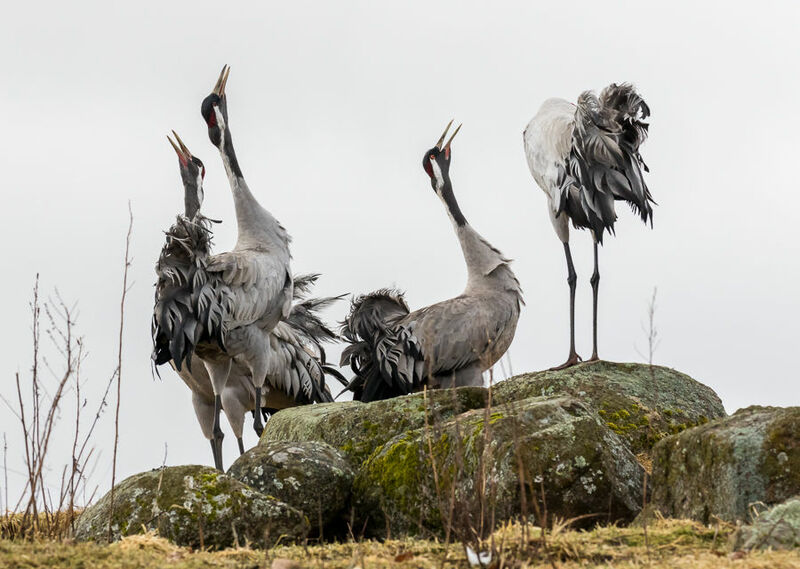 Every spring thousands of common cranes rest temporarily by Lake Hornborga in Sweden during migration from their winter quarters in southern Europe to the breeding grounds further north in Scandinavia. 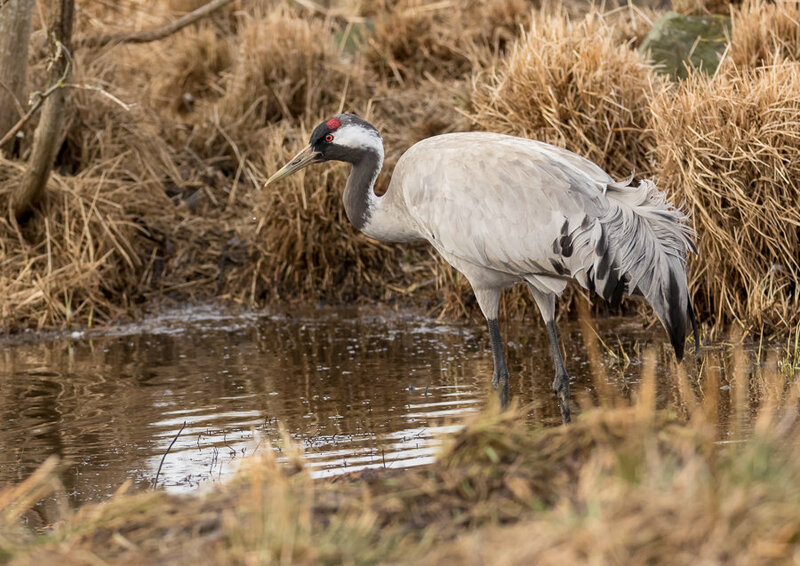 Originally, it was due to leftovers from potato fields that made the cranes rest and eat in this area. When the potato production stopped many years ago, the cranes had no longer an incentive to rest by the lake. 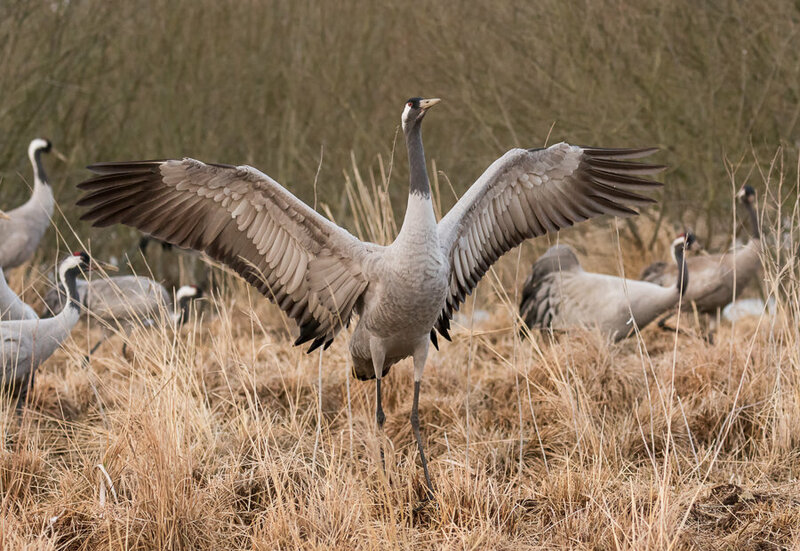 To maintain the many visitors for this local attraction it was therefore decided to start feeding the cranes with grain for the short period every spring. Each evening, after the cranes have taken off into the lake to sleep, a few ton of grain are spread out to feed on the following day. Access to the wildlife reserve around the lake is prohibited from 20 March to 15 July but you can still get as close as about 50 metres from the cranes. To get closer you have to use one of the six hides in the reserve. Three years ago, I sat in one of these small and uncomfortable hides and swore never to do it again. Now, I was back at Lake Hornborga and had decided to give it another try! You have to be very dedicated to go through the hardship with a hide as it is only 2 metres long and 1 metre wide. Being only about 1.3 metres high, it is impossible to stand up at all. And the worst part is, that you cannot leave the wooden box for 16 hours! In the early morning of April 4th, I had to walk in total darkness from the parking lot trying to find the hide some 700 metres into the reserve. My headlight came to great use crossing the field. 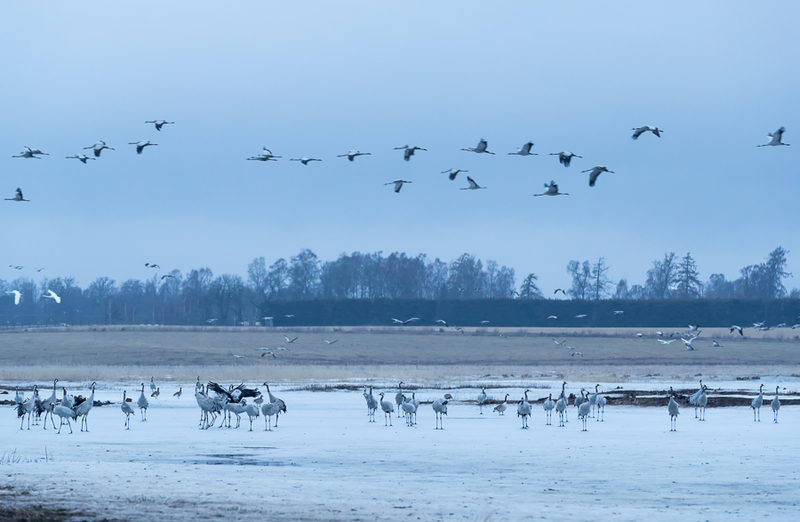 The cranes are standing in the lake during night and will return to the area at sunrise and you have to be organised in the hide before they arrive. Thus, you have to be inside the hide before 4:30. I brought with me a lot of warm clothes and a sleeping bag just in case. 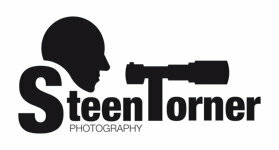 Furthermore, you need some food supplies as well as hot and cold drinks – besides a lot of photo equipment of course. 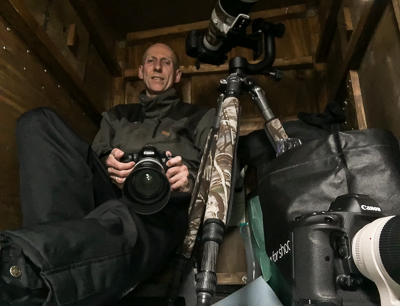 Obviously, the space inside the small hide get very cramped. This time, I also had with me a big 500mm lens and a tripod. Although it came to use during my stay, I recommend not to bring such a heavy gear and a tripod as it fills up the hide. 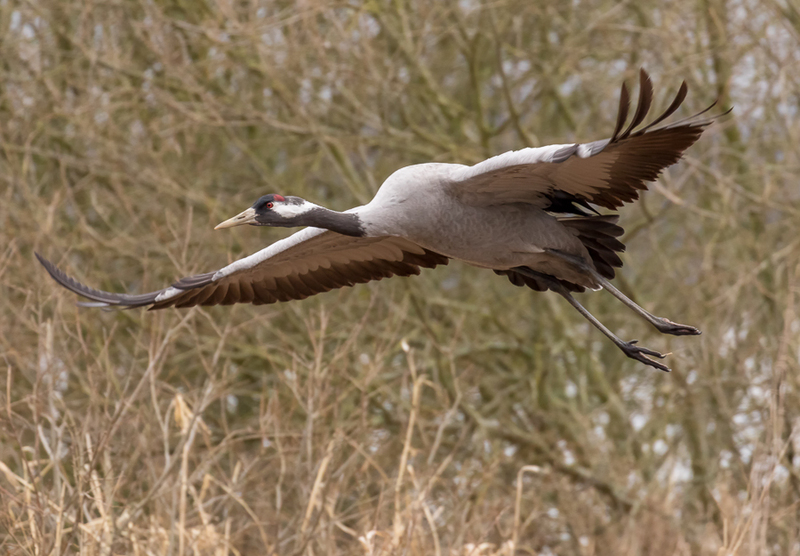 The cranes are very close so a 70-200mm or a 100-400mm zoom is fine along with a wide-angle lens. I relaxed with some coffee and bread before the cranes started to arrive from the lake. During the morning thousands of cranes gathered around the hide. Below is an image from 6:30 when the birds starts flying in. You hope for a lot of cranes to photograph but suddenly realise that it could well be too many. When a good pose was in sight most often other cranes blocked the view. Furthermore, this year a huge amount of whooper swans made it even more difficult to photograph the cranes. This image shows the many birds outside the hides. All the openings in the hide are only 80 cm from the ground and you need something very low to sit on giving you the optimal high. Three years ago, I used a much too high stool and had to bend over to reach down to the openings. This time, I was better prepared and brought with me a suitable size stool to use. Talking about openings. They are only 24 x 24 cm and the lens is not allowed to be outside as it might disturb the cranes and make them take off. Therefore, you are very much restricted when taking images. 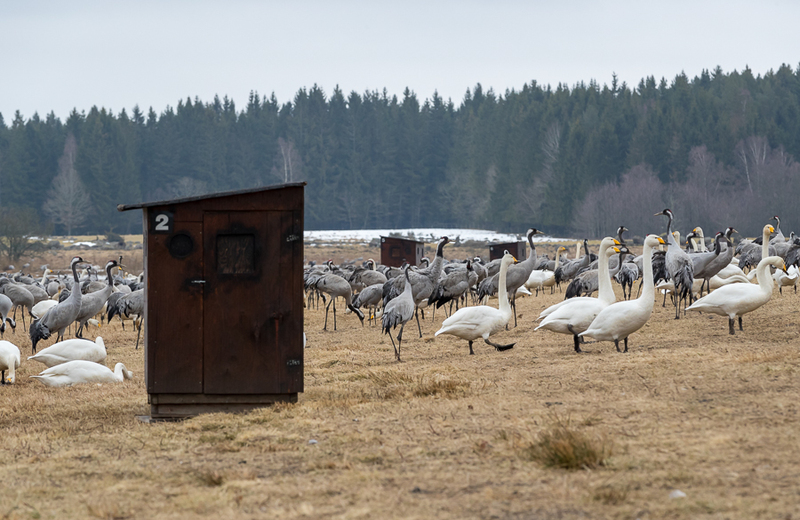 You have to go through a lot of hassle, but it is definitely a great experience spending a whole day among thousands of cranes and whooper swans – and very noisy! Also, it allows for some unique photo opportunity compared to the photographers outside the fence. 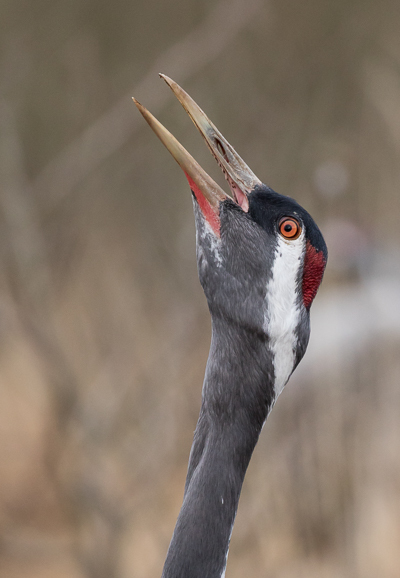 You can get very close to the cranes when sitting in a hide. 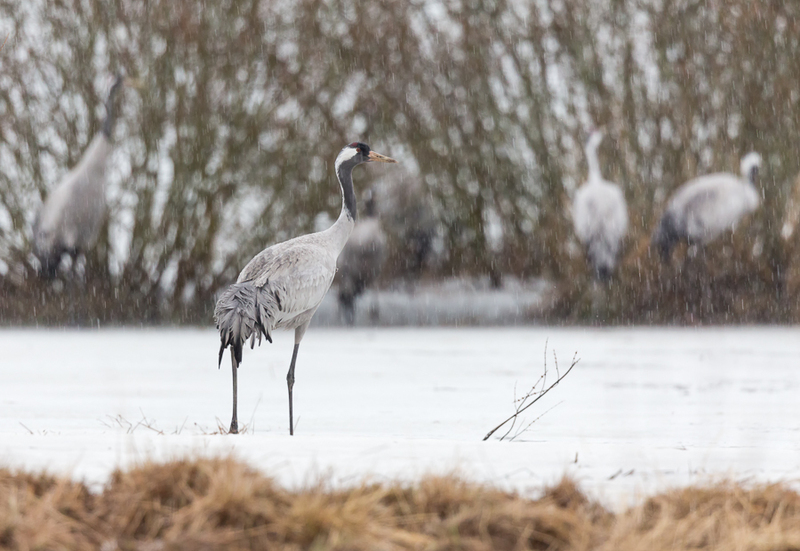 Unfortunately, the weather was cloudy and dull so I used some sleet to bring on a bit of atmosphere and the unusually cold spring even made it possible to photograph cranes on ice and snow. 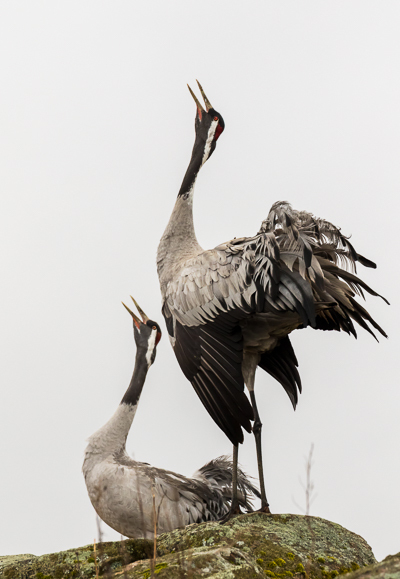 These cranes were standing at a long distance, so the big lens came into use. Following some hours of concentrated photography, I enjoyed a nice warm lunch – pot noodles! Later in the afternoon I had a short nap. Not because I was sleepy, but I had to lay down to stretch my body. Still, I had a few hours left and managed to get a few more images of isolated cranes. The light became a little brighter on this crane late in the afternoon. 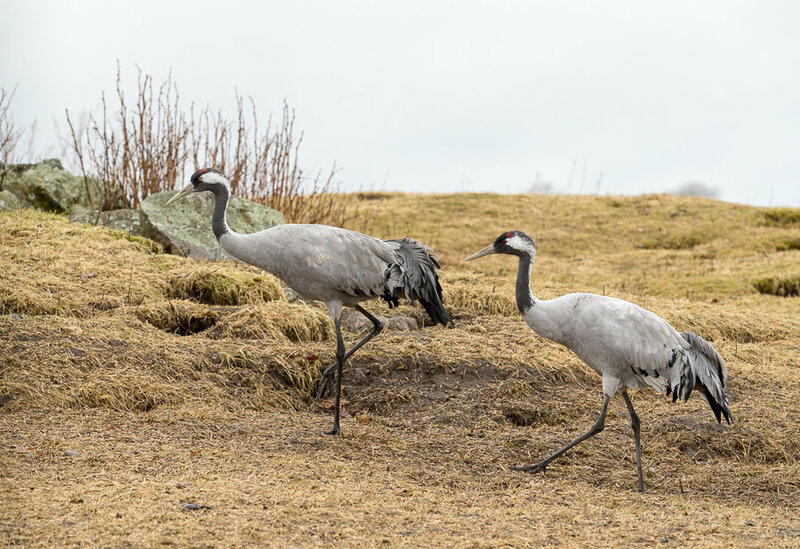 I waited a long time to get these cranes to pass by on the hillside just outside the hide. Just before sunset this crane showed the great wingspan of about 2 metres. By sunset the cranes began to leave in large groups and after a while it was all over. Soon the Supervisor arrived and I could get out of the hide. Great to stand up again after 16 hours in the little box. I hurried back to the hotel to get a hot meal and a well-deserved glass of wine before the kitchen closed. When I returned home after some 400 km drive the next day, I told my wife that this time it was definitely my last visit to the little wooden box. Never am I to repeat the 16 hours in the worse photo hide I have ever experienced. It is too small and the inability to stand up is a huge problem. Not to mention the lousy openings to use for photography and the all too many cranes and swans.